The Emotion was Clearaudio's first budget turntable when it appeared two years ago. This new SE version is the German acrylic meister's grown up incarnation of that simple, but beautifully executed record player. It comes complete with Clearaudio's Satisfy carbon Directwire tonearm and a Beta-S MM cartridge as a fit and forget package with a good pedigree. Clearaudio, after all, makes some of the most ambitious designs in the high end market. The original Emotion continues at the lower price of £1,140, so the question is does this SE version represent the same great value? For the SE, Clearaudio has upgraded a number of key aspects of the standard Emotion. For a start, the platter is 28 millimetres thick, an increase of 10 millimetres, a change which will add mass and thus increase inertia. The company is using CNC-machined GS-PMMA (Perspex) for the platter and a ceramic alloy for the bearing; the shaft that sticks up from the bottom half of the bearing is white and only needs lubricating once every few years. It avoids the need for a thrust pad by using opposing magnets to take the load of the platter. The main plinth is precisely hewn from 20-millimetre acrylic and supported on rubber-tipped aluminium feet. The standard Emotion has acrylic cones which, while they look cute, do little to keep out resonance. The new feet also offer precision adjustment, a useful feature for a turntable with a dynamically balanced arm like that supplied. The freestanding motor comes in a very solid metal case, which has a separate stainless steel base to provide some mass damping and gives the motor greater stability. The drive pulley is acrylic again and is held on to the ceramic drive shaft by three nylon grub screws – screws that have slot heads in and are rather vulnerable to excess force. The same is true of the grub screws in the new arm base – the standard incarnation has a hole in the acrylic plinth, but here CA has added the type of base found in its dearer models. The arm itself is a well-executed, simple design with gimbal bearings and a magnetic anti-skate system, which consists of a lockable bolt with a magnet in its tip. The arm's appearance is deceptive in some ways, because it has sapphire and ceramic bearings and a woven carbon fibre arm tube for low mass and high rigidity. The Directwire in the name points to the fact that the arm wiring runs unbroken all the way from the cartridge tags through to the phono plug. It's something which is not uncommon in many arms, but represents a variation on the output sockets approach found in other CA designs. Also included in the well-designed packaging is a Souther clever clamp, a plastic record clamp which uses friction to pin the vinyl down. Although the clamp looks a bit like a cheap plastic coaster, it does work effectively. Clearaudio supplies a spare belt too, as well as bearing oil and a dedicated alignment gauge for ease of set up, not to mention a selection of Allen keys and jeweller's screwdrivers to do the job with. The supplied Aurum Beta-S cartridge is the top model in CA's moving magnet range and retails for £455 on its own. The cartridge mount is attached to the Satisfy arm tube with CA's distinctive single bolt fixing. The build and finish which Clearaudio consistently achieves is a good enough reason on its own to buy a turntable like this: if you like the look of matt acrylic, it's a real winner. Attention to detail is excellent wherever you look. The adjustable feet, for instance, have three holes around their periphery where you can slip in a suitable lever (a screwdriver or allen key) and then turn to achieve the desired height. It's a stiff turn – hence the need for leverage – but that's because the thread is damped to kill resonance. The motor casing is also superbly cast and finished with bead blasted chrome that looks bullet proof by audio engineering standards. The ceramic magnetic bearing is also quite a luxury and not something I've seen on turntables in this price range before. There is no shortage of good and very good turntables available for this sort of money, the one which immediately springs to mind is last year's award winner, the Townshend Rock 7. Although the Townshend is a little bit more expensive when an arm and cartridge is included, without doubt it sets the standard at this cost. There's the Linn LP12 Majik for the same price, and Funk Firm's remarkably nimble V2, which offers a stack of analogue thrill power for £1,390 including an arm if not a cartridge. The Emotion SE is not particularly difficult to set up thanks to the supplied alignment gauge, but it does reveal any shortcomings in that department, as I found out when I set downforce at what appeared to be the recommended two grammes. This resulted in occasional groove-skipping, which I managed finally to eliminate only once I'd screwed the counterweight further onto its threaded stub in order to take the tracking weight up to a not inconsiderable 2.4 kilograms. Properly fettled, this turntable produces a full scale and open sound which is strong on timing and imaging, but not quite so hot on absolute precision, there's a slight halo around voices and instruments that adds a bit of life and presence to proceedings, but it's not there in the grooves themselves. That said, the Emotion SE is a very enjoyable and engaging listen which does a fine job of pulling out fine detail across the band. Phantom Limb's percussion work is fully evident on Don't Say A Word, and the acoustic guitar is extremely convincing: I found it easy to let myself be carried away to another time and place by this song. The Clearaudio is also very good at revealing the sense of 'being there' that live recordings can deliver, the extra air that it adds to the mix sounding highly realistic especially if you don't push the level too hard. 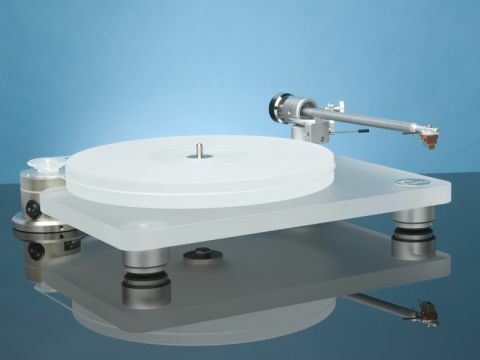 You can only really tell that this stylish turntable is elaborating slightly on the recorded truth by comparing it with something better, specifically the Townshend Rock 7 with a Rega arm and Goldring 1006 MM cartridge onboard. This combination delivers a cleaner, more substantial overall result which benefits from a wider dynamic range as well. Judged on its own terms, the Emotion SE is a very capable turntable that's as much at home playing Beethoven piano sonatas as it is Led Zeppelin. Indeed, I was quite surprised at how much foot-thumping it dug out on the LZ track Hangman, there's clearly little restriction on bass depth. In addition, its presentation also lower level listening, where the air and sparkle it finds on the disc serves to provide contrast and timbral richness. While not as good as the very best performers in its class, the Clearaudio Emotion SE is no slouch either, and it's beautifully put together – rather more so than the Townshend, it has to be said. Its sound is clearly a marked upgrade on that provided by the regular Emotion, and elements like the adjustable feet and arm base make it a lot easier to install and set up. I enjoyed the life it brings to the party without adding too much of its own character as acrylic platters sometimes can. At the end of the day, I found myself playing the Prodigy far too loud which is always a good sign.